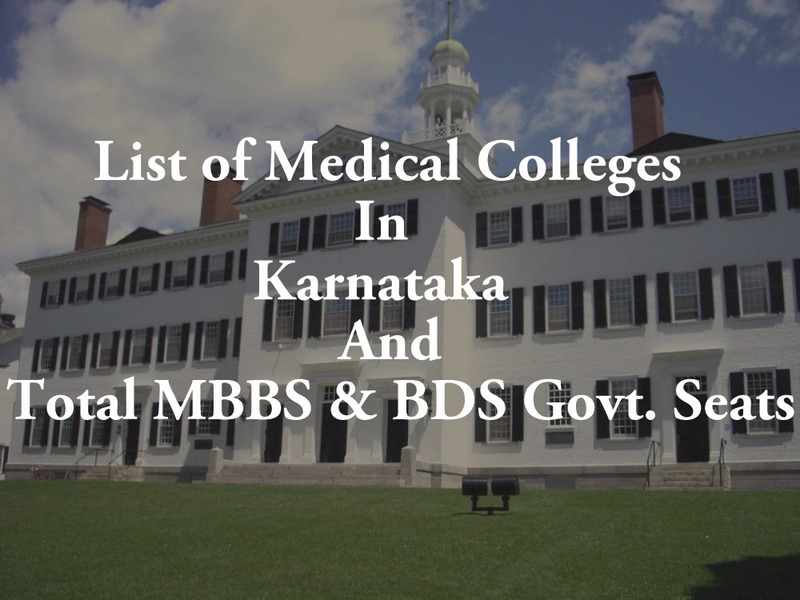 List of Medical Colleges In Karnataka Total MBBS & BDS Govt. Seats: NEET 2018 Counselling is just about to start. So, you must be searching for the best medical colleges in your state. Here, in this article, we have listed all medical colleges in Karnataka state. In this article, we have not just listed MBBS & BDS medical colleges but also added some other medical colleges for different courses. Soon we will provide the “Top MBBS & BDS Colleges in Karnataka” for NEET Counselling. Below is the table you will find the list, but it is to be noticed that they are not in any rank order. The list was made after research and added as we found the colleges/university. So you must go through all the table and then decide which colleges you want to admission or fill in the NEET application form/ other entrance exam forms. Also visit: NEET 2017 Counselling Procedure Date Eligibility Required Documents. Our team is working on making another list of Medical colleges in Karnataka with fee structure and courses. So you must bookmark us or like our facebook page to get a notification whenever there is update. Our mission is to make this site medical college directory with researched content. A. J. Institute of Medical Sciences & Research Centre, Mangalore Rajiv Gandhi University of Health Sciences Trust 2002 150 Recognized for 100 seats. Permitted for renewal of permission for increase of seats from 100 to 150 for the year 2012-2013. Bangalore Medical College and Research Institute, Bangalore Rajiv Gandhi University of Health Sciences Govt. 1955 250 Recognized for 150 seats. Permitted for renewal of permission for increase of seats 150 to 250 for 2012-13. Basaveswara Medical College and Hospital, Chitradurga Rajiv Gandhi University of Health Sciences Trust 1999 100 Recognized (Issued show cause notice for withdrawal of recognition u/s 19). Belgaum Institute of Medical Sciences, Belgaum Rajiv Gandhi University of Health Sciences Govt. 2006 100 Recognized when granted on or after December 2010. Employees State Insurance Corporation Medical College, Bangalore Rajiv Gandhi University of Health Sciences Govt. 2012 100 Permitted u/s 10(A) for 2012-13. Father Mullers Institute of Medical Education and Research, Mangalore Rajiv Gandhi University of Health Sciences Trust 1999 150 Recognized for 100 seats. Permitted for increase of seats from 100 to 150 u/s 10(A) for 2012-13. Govt. Medical College, Mysore Rajiv Gandhi University of Health Sciences Govt. 1924 150 Recognized Permission for increase of seats 100 to 150 for 2012-13. Jawaharlal Nehru Medical College, Belgaum KLE University (Deemed Univ. ), Belgaun Trust 1963 200 Recognized for 150. Permission for increase of seats from 150 to 200 for 2012-13. K S Hegde Medical Academy, Mangalore Rajiv Gandhi University of Health Sciences Trust 1999 150 Recognized for 100 seats. Permitted for renewal of Permission for increase of seats 100 to 150 for 2012-13. Kempegowda Institute of Medical Sciences, Bangalore Rajiv Gandhi University of Health Sciences Trust 1980 150 Recognized for 120 seats.Permitted for increase of seats from 120 to 150 u/s 10(A) for 2012-13. MVJ Medical College and Research Hospital, Bangalore Rajiv Gandhi University of Health Sciences Trust 1997 100 Recognized When granted on or after 24.05.2006 and onwards. Navodaya Medical College, Raichur Rajiv Gandhi University of Health Sciences Trust 2000 150 Recognized for 100 seats (when granted on after Mar2007).Permitted for increase of seats from 100 to 150 u/s 10(A) for 2012-13. Raichur Institute of Medical Sciences, Raichur Rajiv Gandhi University of Health Sciences Govt. 2007 100 Recommended for recognition. Rajarajeswari Medical College & Hospital, Bangalore Rajiv Gandhi University of Health Sciences Trust 2005 150 Recognized for 100.Permitted for renewal of permission for increase of seats from 100 to 150 for 2012-13. S. Nijalingappa Medical College & HSK Hospital & Research Centre, Bagalkot Rajiv Gandhi University of Health Sciences Trust 2002 150 Recognized for 100 seats when granted on or after Feb2007. Permitted renewal of permission for increase of seats from 100 to 150 for the year 2012-13. Shimoga Institute of Medical Sciences, Shimoga Rajiv Gandhi University of Health Sciences Govt. 2007 100 Recommended for recognition. Sri Siddhartha Medical College, Tumkur Rajiv Gandhi University of Health Sciences Trust 1988 150 Recognized for 130 seats. Permitted for renewal of permission for increase of seats from 130 to 150 for the year 2012-2013. Srinivas Institute of Medical Research Centre, Srinivasnagar Rajiv Gandhi University of Health Sciences Trust 2011 150 Permitted for renewal of permission u/s 10(A)for 2012-13. Subbaiah Institute of Medical Sciences, Shimoga, Karnataka Rajiv Gandhi University of Health Sciences Trust 2012 150 Permitted Permitted u/s 10(A) for 2012-13. Yenepoya Medical College, Mangalore Rajiv Gandhi University of Health Sciences Trust 1999 150 Recognized for 100 seats. Permitted for renewal of permission for increase of seats from 100 to 150 for 2012-2013. We are updating this article with new information so you may want to bookmark us to never miss an update again. Also, do go through other posts in the same category for the list of private and government college/university from other states. Hope you have found what you were looking for but if you have any question/doubt then comment below here and one of the team members will assist you. If you liked the content then please share it with your friends who may be looking for same. I want to know the details of MBBS course in different colleges in karnataka with there fee structure and any extra payment.Iqualified in NEET.